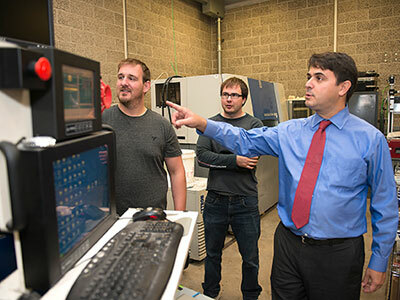 Students fortunate enough to be in one of NIU’s mechanical engineering classes with Federico Sciammarella can look forward to being on the cutting edge of 3D printing and manufacturing. Sciammarella uses his personal experiences with 3D printing to enrich the classes he teaches. 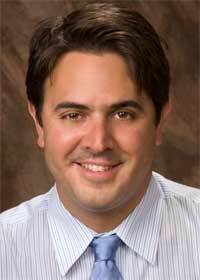 That has helped him earn the NIU College of Engineering and Engineering Technology Faculty of the Year Award in 2014. Bringing his 3D metal printing expertise into the classroom, he encourages his students to participate in 3D printing challenges. “It is pretty amazing to see the things students come up with and that’s really exciting because you’re allowing students to be creative and see the results right away,” Sciammarella said. Daniel Nikolov, one of Sciammarella’s students, assists in operating the college’s 3D printers. Nikolov and other students have worked on Sciammarella’s class projects. The skills he and other students have learned have allowed them to work on their own projects, including a fixing part of the scoreboard at Huskie Stadium. The university requested a solution for some exposed areas on the scoreboard, and students designed caps and used a 3D printer to create them. They were successfully installed. It’s real-world work that Sciammarella’s students can expect to prepare them for bright futures. Beyond the classroom, Sciammarella’s students benefit from his ongoing, global research in metal 3D printing. He is at the forefront of research to better control the properties of metal 3D printing. He helped to secure a grant from the National Institute for Standards and Testing (NIST) to conduct that research, and has hired NIU students to assist. One graduate went on to work for NIST in 3D printing. As part of the road map advisory board of America Makes, a national organization targeting manufacturing competitiveness through 3D printing, Sciammarella is helping to guide how 3D printing technology and manufacturing should be taught in the United States. With the customization that 3D printing allows, manufacturing will become more about making value. Graduates with 3D printing skills will enjoy a higher level of marketability. “It’s that next level of manufacturing that will have the truly high-paying careers and opportunities for everyone to participate,” he said. Through previous work, Sciammarella developed business relationships with companies in South Africa who were using 3D printing similarly. He has traveled to South Africa to give presentations and develop networks and opportunities for NIU students to conduct research there, and their students research here. He also is working on building networks in Mexico and Italy. “Creating global partnerships gives students the opportunity to see that 3D printing is a growing worldwide phenomenon,” he said. Closer to home, his involvement with the NIU EIGERlab, the university’s Rockford-based innovation and product development center, keeps his interests regional. This additional work makes him an instructor passionately engaged in preparing local students for a global future. “Many of our students are local. We’re providing the local region that talent base so, if our graduates want to stay in the area, they can be very competitive,” Sciammarella said. His students appreciate what they are learning. Shaun Maconaghy, a senior in mechanical engineering, has taken four classes led by Sciammarella, and says his focus expands beyond teaching technical skills. “His passion for teaching students how engineers can impact the world in more ways than just designing systems and components shows through in his classes,” Maconaghy said. Nikolov said Sciammarella is also a great mentor. 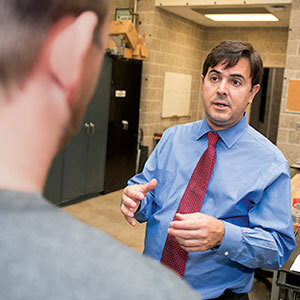 Promod Vohra, dean of the NIU College of Engineering and Engineering Technology, said passion for teaching as well as scholarly activities creates excellence in the classroom. Sciammarella is exemplary, he said.